Friedrich IV (Frederick): Elector Palatine of the Rhine (Kurfürst von der Pfalz), 1583-1610; was known as Friedrich der Aufrichtige (Frederick the Righteous). He was born 5 March 1574, the only surviving son of Ludwig VI (1539-1583), Elector Palatine and Elisabeth of Hesse (1539-1582). His father had died in 1583 and Friedrich came under the guardianship of his uncle, Johann Casimir of Pfalz-Simmern, an ardent Calvinist who administered the Palatinate from 1583 until 1592. Upon his uncle’s death, Friedrich assumed control of the government, ruling until his death on 19 September 1610. He was succeeded by his son Friedrich V.
Friedrich was a good-natured, indolent, insignificant prince, but had capable advisers. In 1608 they brought about a union of the Protestant imperial estates against the growing Catholic party, known as the Protestant Union, which with the aid of other nations, principally France, aimed to break the might of the Catholic imperial house. On both sides preparations were made for a war which was to determine whether Catholicism or Protestantism was to predominate in Germany, a concern which had long since ceased to be a purely religious one, but involved matters of money and temporal power. In the Palatinate conscription was begun. Very likely the Anabaptists refused to take any part in military drills. Is this perhaps the reason for the sterner attitude now taken against them? Until then there had been hesitation. The emperor and the Diet wanted Anabaptism completely eradicated. But the increasing and spreading dissolution of the empire was of benefit to the Anabaptists as to the Protestants in general. Many princes and imperial cities simply ignored the imperial edicts and the resolutions of the Diet, refusing to expel persons who were useful to their realms for their industry and skill, and who often won the sympathy of their fellow men and even of the minor officials through their honesty. The Palatinate was interspersed with the territory of other temporal and spiritual rulers, with whom exiled Anabaptists frequently found hospitable reception. Was the Palatinate to drive industrious, obedient citizens into the realm of the counts of Leiningen, Falkenstein, and Nassau, or the bishops of Worms and Speyer? It seems at times that the rulers had no intention of enforcing the severe edicts they passed at the insistence of their chaplains and church councilors. Many officials simply did not carry them out. When the officer of Bretten was to expel an Anabaptist in 1576 on the basis of an earlier regulation of Elector Friedrich III, he stated that he was unable to find the regulation. The sterner measures now undertaken in the Palatinate were perhaps passed for the same reason as those in the canton of Bern several decades later, when Bern, threatened by Louis XIV, increased its military strength and would not tolerate the steady increase in the number of its nonresistant citizens. It may thus have been not so much a concern for the spiritual welfare of the subjects and the religious unity of the state, as a concern for the security of the government that compelled so many of the quietest and most industrious citizens to choose between abandoning faith or home. Yet there are no records in the archives to confirm this assumption. Parsons and church councils merely report that the Anabaptists mocked at the citizens who presented themselves for military drill. The reported utterances of the Anabaptists indicate that they had taken on many of the characteristics of their neighbors. They sound very different from those 50 years before. According to the records of the inspector Titus Wittich in Dirmstein their leaders declared, "We have our own preachers who are much better than you. We are surprised that you are so greatly and so vainly concerned with us and incite the government against us, which would otherwise not take any steps against us, and has no right or authority to do so. We are a group in ourselves and in short, here we are, here is body and life. We do not wish to be advanced, much less to dispute, and least of all to make converts." The Anabaptists of Grosskarlbach, Weisenheim am Sand, and Hessheim assured him that all talking would be in vain, even if 12,000 dozen theologians would try to persuade them to enter the state church. At any rate the number of Anabaptists in the Palatinate was greatly reduced, owing in part to emigration to Moravia and in part to the dying out of some families. Göbel, Ernst and Richard D. Thiessen. "Friedrich IV, Elector Palatine of the Rhine (1574-1610)." Global Anabaptist Mennonite Encyclopedia Online. April 2007. Web. 21 Apr 2019. http://gameo.org/index.php?title=Friedrich_IV,_Elector_Palatine_of_the_Rhine_(1574-1610)&oldid=91808. Göbel, Ernst and Richard D. Thiessen. (April 2007). 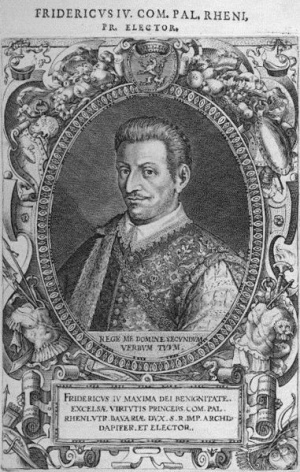 Friedrich IV, Elector Palatine of the Rhine (1574-1610). Global Anabaptist Mennonite Encyclopedia Online. Retrieved 21 April 2019, from http://gameo.org/index.php?title=Friedrich_IV,_Elector_Palatine_of_the_Rhine_(1574-1610)&oldid=91808. Adapted by permission of Herald Press, Harrisonburg, Virginia, from Mennonite Encyclopedia, Vol. 2, p. 385. All rights reserved.